I don't know. Bur there are no droplets on them. Some more routing of the extra gages wires and tubing was done progressing out of the tunnel. Still not to engine compartment yet. Installed grip-sert nuts in rear structure to mount the chrome ignition coil bracket. Installed Mouse House 110 Engine into its new home. The way you see the engine is the way it was rolled under the car and lifted up into place. Transmission mount and rear mount hardware installed. Left and right control rods/brackets and hardware installed to differential. PG dipstick installed. Right driveshaft installed. PG modulator line routed and connected to modulator valve. PG breather installed. ps: please note the close-out panel I installed where the fresh air hose exits the compartment. This is the first photo showing the detail. Left driveshaft installed. Coil installed in bracket. Right heater hose and support installed. 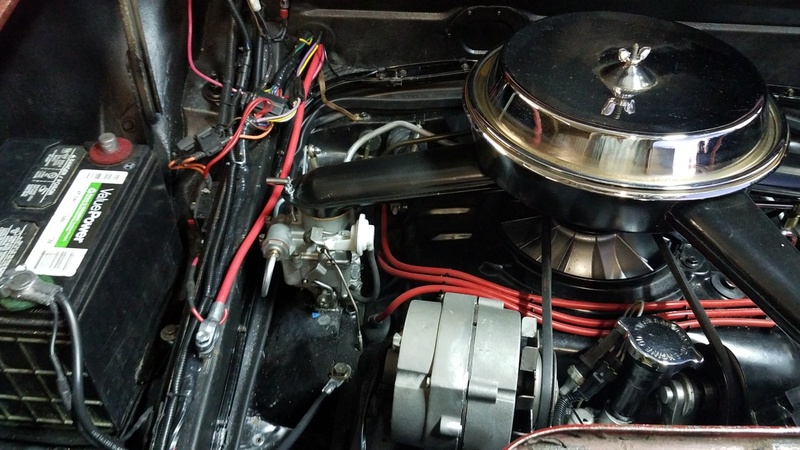 Routed the extra gage wires and 1/8 tube into engine compartment. Ty-rapped wiring within tunnel area. Still need to complete ty-rapping wiring in transaxle area and secure wiring properly in cabin. Installed heat duct and connect flexible hose to it. Installed a better PG modulator tube. The original tube to car was totally rusted. Replacement was just greasy. Cleaned and installed. Used a tube clip to secure it to the PG dipstick tube. Minor bending had to be done to keep tube in proper entrance point into compartment. A bit more done today. Only had a few hours to do a few tasks. Closed up the tunnel installing the tunnel covers. Installed front shroud. Installed engine body seal and retainers. Installed Grip-certs in skid plate for mount cover installation. We had a 75 degree day so I took advantage and cleaned, sanded and painted the rear grille panel. Other small items completed in preparation for lowering car onto its wheels. Finally got the Turn signal indicators changed over to BA9S LED bulbs. So what can be changed over is done. Panel is ready for installation. Clock installation will be done later. Also attach is a photo of the engine after body seal installation. I hope this jewel brings you many years of enjoyment once it is finished. We will see how long I keep this beauty, after I get the Camaro then my Coupe on the road. As for Greenbrier, it is known that I want to sell it as soon as I can, following its road worthy designation. 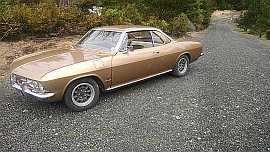 I bought this beauty getting the Mouse House 110 engine so Donna could have a classic to drive around. Having a reliable engine was a necessity. She would only be driving it while the Camaro was being cleaned up of all its issues, installing updates/mods and refurbing the interior. She doesn't drive manuals, so automatics is needed to protect her and the rest of us. No other work done today. We had to search my bins and work area for an air cleaner grommet. It seems I forgot to order one. The one off the removed engine was a gooey mess. We had to locate the one for my coupe, which I misplaced. Finally did locate 3 grommets. Picked the best for the engine. Got some new center caps for the rims that are going to make the car look spiffy. Oh yes, new tires and rims have been added to this car. Got to keep her safe in it. Got to get some seat belts in the front, at least. Looking around for those recently. 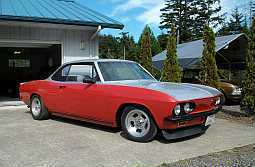 We put a 66 style front spoiler on it recently. Makes it look better. More like my coupe now. We have done a lot to it since we got it. Making it our car and making it right. Soon it will be rolling again under her own power. The rear engine mount cover is now installed. Installed negative cable. We got the right exhaust heat shield installed. I will need to adapt left exhaust heat shield to work with the Harley exhaust pipe(muffler/tube). 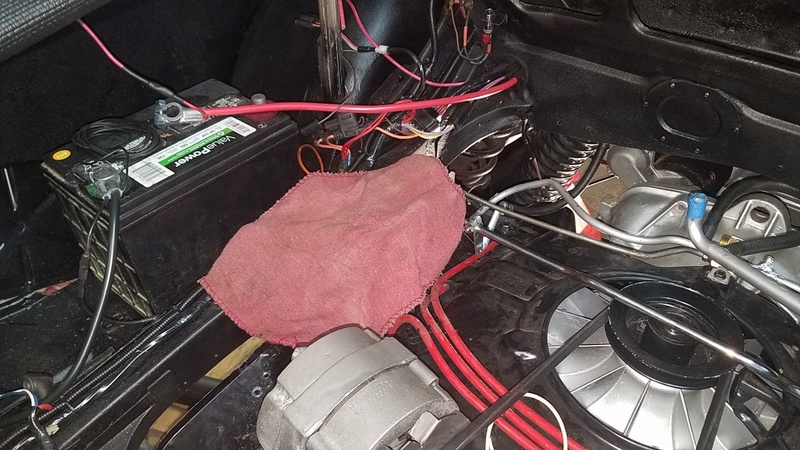 The wiring is now all routed and ty-rapped into the engine compartment. Tomorrow I will complete installation of items in area forward of the ne on left side. Holding off connecting starter wiring until everything is completed. The shifter has been mounted on the instrument panel. Panel has been screwed to the dash by 2 screws. We will continue its installation tomorrow. Cleaned, treated and painted the area where rear grille inserts into body. Area had a bit of grease and rust that need to be attended to. The parts bins have gone from 3 17 gallon bins down to 1, which is about 1/4 full of items needing to be installed. These are items I can do during this maintenance cycle. I have 2 more bins at the garage with some items that are waiting until after the car is on the road. One bin has the never used front brakes, reworked drums and hubs with new bearings off my coupe that are planned to go on this car. Installed rear grille. 5 of the holes were oversized. All 4 on the sides, which I used clip nuts on the panel for the lower holes and clip nuts on the body for the upper holes. The far left upper hole was drilled up to take a 10-32 grip-sert. All fasteners are now tight. Completed engine wiring, excluding starter. It will be last to be done when everything else on car is checked as completed. Routed tube for Manifold indication along front of compartment. Installed 3 plastic clamps with washers on seal retainer screws to hold it in place. Installed main fuel line to junction on engine and routed to bay in front of compartment. What a plan when I cut the hoses for the filter. The hose of the filter is actually 1 inch too long. A small trim and it lines up perfectly. No bad considering all the rework I had to do to get it secured. 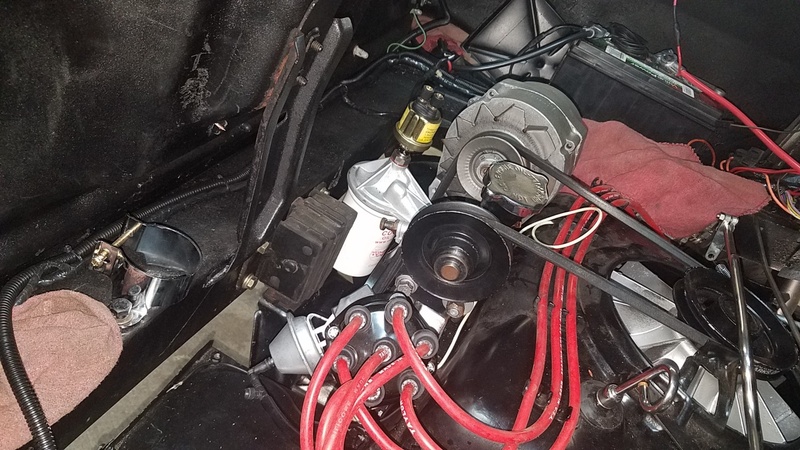 Tomorrow I will hook up engine test stand fuel system to this new line and energize its pump to check for leaks on this line and all others to the carbs. Positioned battery on its tray. It will be secured tomorrow after I remove the test battery connector and its cable from the circuit breaker. Secured left side of instrument panel and mounted flashing parking light. Found 2 left side exhaust heat shields, 1 LM right side exhaust heat shield and 1 EM right side exhaust heat shield. After looking at multiple possibilities, we decided to use EM right side exhaust heat shield for the left side exhaust heat shield. It will require trimming the shield along its length to match the right side shield to avoid panel interference. Now I am looking for a better EM right side exhaust heat shield, as this one as rust holes on the aft flange. Any one need any real good LM left side heatshields with band clamps and bolts? Looking to trade for EM heatshields. I will set up WTB separate discussion for this. Parts bins has shrunk to a small 1 gallon plastic container for exterior parts and a metal Pizza Hut lasagna tray for interior parts. OK, I have to ask, I searched, and duckduckgo'd, but couldn't find what a "grip-sert", "gripsert", or "grip sert" is. They also known as rivet nuts, poly-nuts or Klik nuts. If you search for gripsert nuts, you will find them. 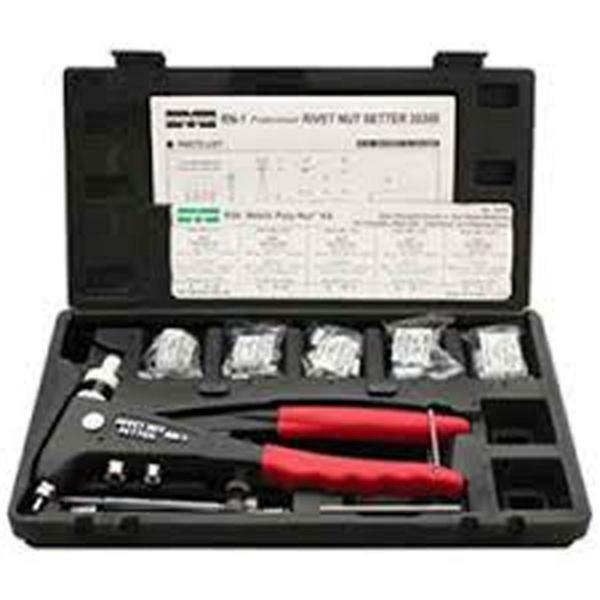 I use a Marson thread setter tool to install them. You have to get the right tool for the insert you will be using. I am using standard thread steel inserts. You can also get inserts in metric and in aluminum. I have used inserts up to 5/16" so far. But I do have 3/8" inserts. Smallest is 6/32. Typical is 1/4-24 or 10-32 that I have used on the cars. Well bad luck hit finally. I was connecting the cable and completed it and was working on connecting accelerator rod from the pedal. To my amazement, the TV lever arm came loose from the shaft. This seems to be something that was coming on as it spins on the shaft. It must have happened before and was hammered tight again. Anyway, I am looking for a good TV lever for a 1965/66 Powerglide. Has anyone got one laying around. I have a powerglide I can tear into , but prefer to find one that is not installed. Please send me a PM if you can help. Thanks. Engine fuel lines were pressure checked and no leaks were evident. Used test stand pump and tank to check engine lines. I made a jumper to power the pump from the battery on the stand. No need for the whole stand to be powered up. Main fuel line from chrome fuel filter is now hooked up to engine main fuel line. Left heater hose installed. Test lead and battery connector removed from circuit breaker. Connected positive auxiliary wire to circuit breaker. Transmission connection progress and woes described in previous post. I cleaned up a fairly decent TV lever to engine cross shaft accelerator rod. I need to run a die down it to clean up a couple of the threads. Also found a good rod adjustor to put on it. Donna continued with instrument panel installation. It is complete. Just have to complete the center dash panel parts installation. Also need to see where this big power stereo will be residing in this car. While I am spending so much time laying around the seats and floor helping where I can tomorrow, I can do a little planning. If things had gone right the car would have been placed on its tires tonight. But now it looks like a few more days. Concentrated on pulling TV lever from transmission. I got it out fairly quickly since I had removed it previously for the o-ring change. Rick cleaned up the shaft and lever. Then he repaired the assembly by brazing the parts back together. We used a 1965 TV lever as a guide for proper placement of the shaft into the lever. Following the repair, I installed the lever making sure to ensure shift cable ball was properly engaged. 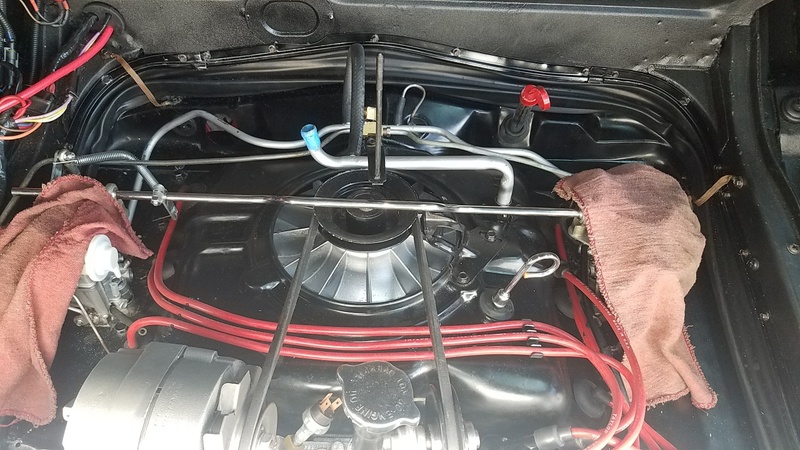 Installed pan and dipstick tube. Connected accelerator rod to TV lever. Verified it was properly adjusted before installing e-clip. Started removing instrument panel so we can remove shift cable to rotate it 180 degrees for bolt up to transmission. First time installing cable. Now I know, verify bolt tab is correct before locking cable housing into shifter structure. 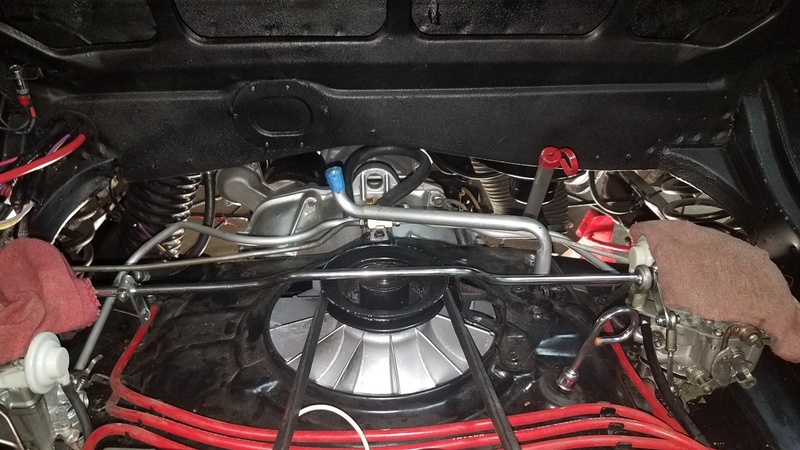 Installed accerator rod to engine and adjusted it. Shifter cable is connected and bolted to transmission. 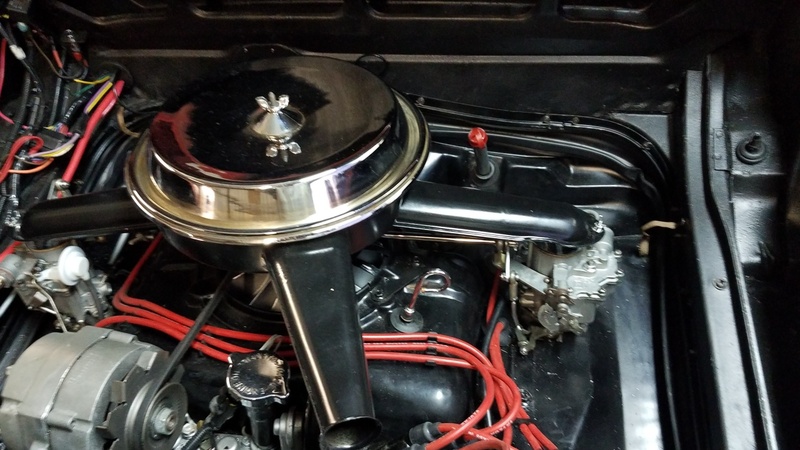 Installed carb air tube and air cleaner. Installed a new modulator line. Battery secured to car. Installed rear tires/wheels and center caps. Working on fresh air filter system to connect to fresh air inlet on heater box. All parts acquired. Working on location and mounting. Ordered new U-pipes for the Harley exhaust tubes. Tubes previously used were bell mouthed to fit the new quiet mufflers for the test stand. So they will stay with that exhaust system. Will work on putting instrument panel back in tomorrow. Had to remove it to remove shifter cable from shifter. This allowed me to rotate cable housing to bolt it up at transmission. Lesson learned. Still need to manufacture parts for left exhaust heat shield installation and brace for internally regulated alternator. That looks like a Vairy nice and new Battery cable ya got there. Just a few more items and she will put back on her tires and go for a 100 mile drive around Savannah Metro area. That will give the Mouse House 110 engine some fresh air away from this hanger. Using engine test stand fuel pump, pressure checked engine fuel lines following installation of a new Clark's right line on the left carb. Had a leak again at the junction from the new line. Disconnected every line and started by installing and tightening the new left line first, then the right line, then the main fuel line. All tightened up without any undue stress to maintain a position. Rechecked and no leaks this time. Reconnected main fuel from tank to engine supply line. Installed air filter on fresh air port on heater box. Serviced Powerglide with 7 pints of DexMerc fluid. Wheels and tires were put on yesterday. Today I jacked her up and removed ramps, jack stands and wood blocks. She is sitting on her tires again. Still have to install dual exhaust. Awaiting shipment if U-tubes from Clarks. Also have to complete installation of instrument panel. Then I can do power on checks to verify everything works before starting engine. A couple more days and a drive with the car will be possible. I figured I can lift each side when needed to put exhaust and heat shields on. We didn't need it as high as it was either to put exhaust on. Arms would get tired bolting it up. At least now it is movable, if Rick needs it moved inside his hanger.